This is the summary of consumer reviews for De'Longhi EC155 15 BAR Pump Espresso and Cappuccino Maker. The BoolPool rating for this product is Good, with 3.90 stars, and the price range is $69.95-$99.99. 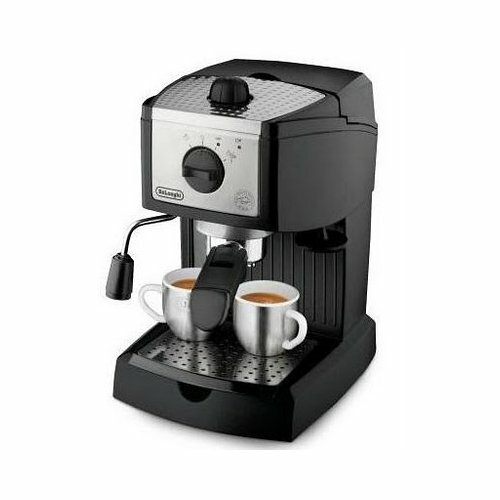 De'Longhi EC155 15 BAR is an espresso and cappuccino maker that works great for novice through seasoned espresso drinkers. It produces quality latte and cappuccino with the swivel jet frother letting you enjoy delicious drinks. It comes with a durable, high-quality stainless steel boiler and 15 bar pressure pump. The warm up time while using the priming procedure is very short. It lets you get to your coffee faster, with less waiting around for the element and boiler to reach the correct temperature. The portafilter inserts allow one or two shots to be brewed at a time and are convenient and easy to use. The water tank holds enough capacity for several rounds of espresso when you have company. The EC155's dual function filter holder, lets you enjoy delicious espresso as you can use ground coffee or convenient coffee pods for faster preparation. In addition, the EC155 is simple to clean with a removable 35-ounce water tank with indicator light and a removable drip tray. It is easy to disassemble, clean, and put back together to continue making your favorite drinks. The machine brews perfect drinks every time at the perfect temperature with two separate thermostats, which allow for water and steam pressure to be controlled separately. Many reviews have mentioned that the frother handle could have been a bit longer and the spout doesn't allow for anything taller than an espresso cup or very short coffee cup. All in all, the De'Longhi EC155 is a good product for reasonable cost that takes up very little counter space. It is easy to use and consistently makes a good cup of espresso every time. This's somewhere between a single and double shot (whereas most machines have a double shot basket). My very first pull, I got a nice dark shot with crema. 2 x double shots espresso. First: the machine needs to heat the water for 25 minutes before brewing. Second: if you're doing a double shot, you've to pause inbetween shot 1 and shot 2. When you fill your shot glass and turn off machine, the crema should be around 2-3 mm high. This machine seems easy, again I've no comparison other than a regular cheapo drip machine, but after reading the directions I was up and pulling a shot in 15 minutes. It's stainless and black, and up top there's a nice little area to warm your cups. Now for brewing a cup of Americano I start with three cups: a 16oz stainless steel pitcher for frothing, a 4oz espresso cup and a regular 12oz coffee cup. can't fit a big enough cup under it - well, it'S an expresso machine and true to typical size of an espresso cup, i don't see the problem. Put the espresso cup (I don't know of any machine in this price range that'll accommodate a regular cup) under the filter and turn the pump on. The coffee pods work well but aren't the end-all be-all and I find grinding some French roast to a fine consistency (Mr. Coffee grinder) filling the "double" filter basket and tamping firmly provides a better cup of espresso. I use the "quick" warm-up method stated in the manual by running two cups of water through the machine before inserting the grounds, and the hot water easily heats up the cup. I've coffee shop style (read: small) cups from Williams Sonoma that I use - there's a tad of a clearance problem, maybe a millimeter - but what I did was brew a double shot, making the cup full, then dump it into a larger cup and add my frothed milk, etc. maybe an extra step but no bother to me personally. The spout doesn't allow for anything taller than an espresso cup or very short coffee cup:, but if you want to use a standard-sized mug, simply pick up the perforated steel plate that the cups sit on and place your mug into the well below. "Regular coffee cups won't fit"...Duh! If you want to drink it in regular cups, make it in an EXPRESSO cup, and pour into the larger cup. I received the EC155, opened the box, and started making my first espresso within no time. This's a good quality machine that's easy enough to use for a novice first time espresso maker like me. It's a wonderful little machine that's really easy to use. This was our first purchase of an expresso machine. First off,the heat up time was about the same. As a novice expresso brewer, I read most of the reviews here before purchasing the EC155. I was excited when I read the many reviews lauding the EC155 as a quality entry level espresso maker. I'd bought a pitcher and a frothing thermometer from Amazon along with my machine. I was so excited that I opened it right away and made my first latte tonight! I purchased the DeLonghi EC155 for 93.00 to use in mean time. Rattleware 12-Ounce Latte Art Milk Frothing Pitcher - small enough to fit under the low steam wand. Low clearance on the steam wand, however, a 12 ounce pitcher will work great to steam milk. I really enjoy Cappuccinos(all milk foam and espresso) and lattes (steamed milk, espresso, and foam on top). I ordered the machine along with a 12-ounce steaming pitcher, thermometer, tamper, and espresso shot glasses. Skim milk froths just fine, but whole milk tastes much better. Always shoot some steam through the frothing wand into an empty cup after steaming the milk to clean it. Because the foaming attachment is only about two inches long (including the metal wand), it's an ordeal to steam milk in any standard foam frothing cup. I decided to start making my own drinks and after reading several reviews and the benefits of pump driven machines over steam driven machines I gave this machine a try. Let the machine heat for a minute to froth the milk. I'd read that the 12 ounce krups milk frothing pitcher made it easier to use the short frothing wand. If you'd use this machine every day, I recommend spending a little more money on a better designed machine. I've bought this machine because of its relatively low price and since it's pump-driven (those machines are usually much more expensive). I conclude that this's a bad design and a machine to be avoided unless you enjoy buying disposable espresso machines. About a month ago (11 months of use) it started leaking water from below the machine. Until I bought this machine in April for $80, I was using a heavy duty Krups machine for 20 years. Bought the espresso machine as a holiday gift. Just remember, machines are machines and sometimes they're deffective.